Currently airing TVB time-traveling drama Captain of Destiny <張保仔> has been receiving scrutiny from viewers for the acting abilities of its cast. 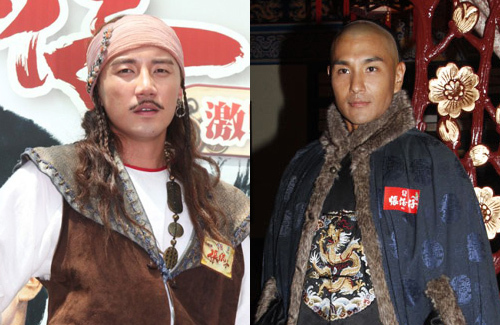 Grace Chan (陳凱琳) was previously criticized for poor acting, while male leads Ruco Chan (陳展鵬) and Tony Hung (洪永城) receive support. Netizens drew up an online poll that pits them against each other in several areas, including acting abilities and looks. Contrary to earlier rumors that Tony’s promotion to male lead would pose as a threat to Ruco’s popularity, Ruco actually emerged the winner, with a total of 320 votes in the online poll. From the comments made by netizens, it also appears that many find Ruco superior to Tony in both acting abilities and physical appearance. Being tall and muscular, Ruco had a natural advantage over Tony. Many netizens confirmed this. There were however, some dissenting netizens, who commented, “Are you wearing your glasses? There is such a big disparity between them!” Tony’s fans also jumped to his defense, commenting on his wit, sweet smile, and dreamy gaze. Ruco just got the better written character to play with, correct me if I’m wrong, didn’t they change the script to fit with Tony Hung playing CPT after Raymond Wong had to put out? @lileric Joel Chan is heaps better than tony, so does that mean he has a better character? Tony hung stopped being the lead when Raymond pulled out. Tony alone wont bring in numbers. He is ok for beginner but very weak when the script demands it. His performance ie generic and is no standout. Maybe ruco has the better role but tony in ruco’s role wouldn’t translate well too. In other words be fair to ruco.,he was excellent.,be fair to tony, he’s new. @lileric even if Raymond had stayed put, I doubt he would still be the lead. ruco has pulling power with his looks and built. @lileric I felt that Tony’s acting is a little inconsistent and cannot really bring out the feelings sometime. For example, I couldn’t feel that he like Grace’s character when he chose to leave her. I felt that Po Tsai’s feelings just changed abruptly and could not give the audience those sour feel of him wanting to be with Grace but instead chose to set her free. His acting was kinda great in the first few episodes, considering that this is one of his first big role. However, towards the early middle of the show the acting was kind of not up to standard. However, I think Tony is an eye candy and it is not a pain to watch him act, although he still has room for improvements. To be honest its hard to feel anything for either Grace’s or Tony’s character. It gets a bit meh, whenever the story is on Grace/Tony portion, feels like filler time lol. @conan2209 well yes and no. There’re plenty with many years of acting experience but still can’t act to save their lives. @lileric i think there is no such things as better or worser roles,but more if a character will suite you or not and also acting skills count of course. if you give tony hung man ho’s character he probably wouldnt have portrayed it better than ruco. or maybe ruco as cpt may even worser than tony hung. i dont know if ruco as cpt will be as convincing as man ho, i think cpt’s character is very playful and foolish in the beginning of the drama and i cant imagine when ruco doing this mad things will be convincing with his facial and body expression. because i have never seen ruco playing such roles. Yup like I said before, only in comparison to poorer actors do really great actors shine. Either that or the role is so good you have no choice but to fall in love with the actor. Ruco is both in here, esp in comparison to the rest of the cast. Joel Chan is pretty decent in here also. Well, sure viewers are gonna compare them both. And Ruco tops it all!!! Really. I enjoyed and watched this drama because of Ruco. Imagine only Grace and Tony. Omg. Joel Chan and Mandy are good too. But they are only the important sides. I wished I can see more of them and Ruco, and less of Grace and Tony. Perfect!!! @dramadrama joel has the confidence and maturity. I love the romance between him and Mandy. Less of Grace please…her acting is so raw. Agree, Grace and Tony were hard to watch. Grace acting was too exaggerated and forceful. Tony always looked like he didn’t know what to do, like he’s clueless and forgot his lines. Joel and Mandy were very enjoyable even though they were supporting roles. Ruco’s eyes have character and soul while Tony’s eyes are just small and beady. it’s unfair for tony to be compared to ruco. i agree looks wise, ruco is much more handsome also acting but tony’s new! i almost stopped watching the show until it gets to the ruco parts. i am on episode 10ish. the show gets really good when it’s at the ruco parts and extremely silly and stupid on the grace/tony parts. not judging anyone’s acting, just there’s a big disparity between the two parts just b/c of the story. too early to judge tony’s acting. i think he’s good for a newcomer as far as acting. i don’t like the way he looks but i can continue watching the show if it is good. @m0m0: Please do continune to watch this COD….Ruco is really really outstanding as Man Ho. Actually, you can give all the Tony/Grace pirates scenes a miss. You wouldn’t miss anything at all. Ruco has won many new fans for his role as the 11th prince in this drama. There’s so much hype and discussion in HK and TVB forums. I just love this man !!! Hmm…I think that these two men have completely different charms. So looks wise, this is matter of taste. I like Ruco. I watch most of his shows. In this series, surprisingly, I mainly watch the Tony parts lol. For Ruco’s parts, I’m annoyed by Kelly Fu’s character and typical palace drama setting. I think the pirates as supporting characters are okay – nothing spectacular, but Tony’s dialogue with them is entertaining. For a newcomer, Tony is charming enough, but he needs a better role, and probably a leading actress that would help him shine more. Ruco and Joel have been around much longer; it is not a fair comparison with respect to skills and experience. If we were comparing Grace with Tony, however, that might be a more similar platform. @iampheng It is not a better role he needs, it is a right role. CPT is not his, first he may be playful in real life, however he lacks that CPT playfulness or even sensuality. Secondly, even when not playful, in more dramatic moments, he absolutely bombed. Skill can be natural, experience is gained. Tony has far more exposure in interacting with audience through his travel series where he displayed a sense of charm, none of which translated onto screen. CPT is not a bad role, it is well written, it is however badly acted. Joel has improved a lot. A bit of heart break does him well I think. Kelly is not that bad, if compared to other female characters. I just don’t like her acting cute but her HA Sim is a nice girl who doesn’t flip flop. The palace drama is to me a cop out. Should have stick to the admiral prince story arc and friendship with local merchant in fighting pirates. Like a 3 way story. I am much annoyed with the possible prince swap story arc. I haven’t reached the latest episode so maybe Man Ho is indeed the prince but if that is the case, CPT the brother is also connected. Frankly I hate the reconciliation between the two men is because they’re blood brothers. That’s so Bollywood. And how nice, we have Grace who looks like she is in one. So many cop out scenes that I hated. Only truthful honest portrayals is Yat Hin/Suk Kwan story arc which frankly has no connection to the story of qing vs pirate story arc. In short, this series is so poorly written that thank goodness at least the acting for some compensates. Much like Three Kingdoms RPG. @funnlim Isn’t a better role, the right role? I haven’t watched as far as you have, so these are all spoilers for me. Clearly, we have different tastes for what we want to see on screen, and I’d like for that point to be respected. Despite that I’ve been here for a long time (I was formerly bytme) I find it very hard to have a fruitful conversation on this forum. I’m never sure if people are truly trying to dialogue with one another or are just talking AT one another. As evidenced by this comment. Is CPT supposed to be sensual? @kidd I would interprete it that way. Why is there an article/news on what Netizen thinks or says? Who are they? They’re not critics. Who cares what they say or think. Ugh. @jjwong Not surprising. Nowadays the media trawls WB and forums for stories. You can’t compare a diamond with glass lol. Tony is ok when he’s acting all cheeky and hyper but put him in a more serious setting and he flounders. Eg those scenes where he surveyed the destruction wreaked by Ruco’s navy and when his dad died. His idea of showing emotions is to pull a somewhat serious face but you just don’t feel it in his eyes (perhaps they’re too small???). In contrast Ruco’s eyes often convey more emotions than words itself. Watch ep 27 and 28 and that earlier battle scene where he called himself a coward and you’ll get my point. I’ve always liked Ruco’s acting but in COD he really acted his heart out and his performance is the best I’ve seen from him so far. I would rewatch COD many times over again (skipping the pirates’ scenes and of cos Grace unless with Ruco) just to enjoy his acting. He’s really awesome in this drama and if he were to win TV king for this role, it is indeed well deserved. As for looks and physique, Tony is miles behind Ruco, sorry Tony. @isay: Fully agree with you. Tony is nowhere near Ruco in terms of acting (I don’t hate Tony, but stating facts). Tony is just not cut out to be lead material (yet maybe?). Ruco may have a meatier role in this COD. However even in dramatic scenes where Tony can showcase his acting skills, he couldn’t pull it off. When his pirate ships were destroyed and his fellow men killed in their battle scene, his face was more comical than sad. Ruco, on the hand, delivered every bit to perfection. In the scenes where he burnt his own ships, the time when he shed tears of joy/pent-up frustrations, sorrow upon learning he bought the cannon, his acting was Best Actor material. His eyes, facial expressions, body language can convey so much emotions without speaking a word at all. Actually, he salvaged the ratings of this show. Frankly, I only watched this COD because of Ruco. What a joke! Tony has to go and hone his acting skills before he can even be compared to Ruco in this respect. And COD’s first male lead is Ruco. I wouldn’t call them co-leads cos Ruco obviously has more screen time, thank god! @isay ruco deserves the screen time…if not, the whole drama would have flopped even worse! @janet72 amen for that! Grace actually said both have equal screen time and I was like “groan………”. Thank goodness this is Ruco’s show. Last 3 episodes and I hope to see more Ruco in the present day scenes. I will miss my gallant Prince Man Ho like crazy…………….sob! Like I said before , TVB is lacking siu sangs. After Bosco and Raymond pulled out, they have to pick Tony for the CPT role. As mentioned before, if not for Ruco , I am very likely to skip COD as the script is poorly written given that it is one of the anniversary drama, put it simply, standard drop. If not for Ruco, I believe the ratings for COD will be very low considering that Grace Chan and Tony hung do not have the “lead “factor to draw viewers.No doubt Tony is new and need time to “sharpen” his acting skill. But he does not possess that charismatic factor to lead a drama. For ordinary role and light hearted role, I think he is ok. But for those role that require more than that such as expressive role, he totally cannot make it. I have noticed that in COD and in the first place, I am surprised why he was so highly sought after!! Quite disappointed with the whole story line of COD.To sum it up, the drama is below my expectation!! Ruco deserves to win this TV King this year but probably won’t due to COD’S mediocre reception. It probably end up with Wayne again. Wayne’s roles are not that spectacular. hope the tv king award doesn’t go to him. Tvb is not only lacking in young men but also in young women…the experienced ones like myolie have left. Kate tsui better leave. Sharon chan cannot make it. What is left behind cannot take lead roles. @janet72: Sometimes I feel Wayne is overrated. He is good but he is already passe. Wayne is cast in an anniversary drama since 2010 and he has 2 this year! His best portrayal was as Chai Gow but after that, he just lost that magic. He is good but I much prefer Ruco’s acting. And to be fair, Ruco is still young and still can take on alot of different roles. Wayne is now limited to roles that befits his age. Ruco is so versatile and can act, sing, good-looking and has a great body. He is both eye and ear candy. He can do no wrong in my eyes!!! @lml1977 tired of watching wayne. he may be experienced but it’s tiring to see him on screen. I want to see younger and good looking actors. you have said everything about ruco which I want to…Hi-5!!! @lml1977 I totally agree with you that Wayne is overrated. Even though he is a 3-time TV king, i still prefer Gallen and Roger over him. I also agree that Ruco is the most complete tvb artist out there in that he has the looks,can act and can sing. I like both actors. But I find that it’s totally unfair to compare a veteran actor and a beginner. Just because Tony got the title character he has to be compared with Ruco. I may sound v fangirling to most of you but Tony got picked as the title character wasnt his choice. It was the director and he only got a week or a month I’m not sure, to prepare for the role. I felt he did his best and he would done better if he was given more time to prepare. And very obvious, There is big gap of experience between tony and ruco. For sure most people will pick ruco for his acting due to his experience and the skill he gained throughout his career. If ruco wants to be compared with then maybe he can be compared with someone on par. If tony wants to be compared with then maybe compare him with someone who entered the field the same year eg Jason ?